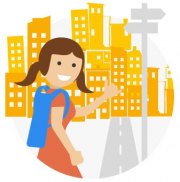 JohnnyBeGuide is a web platform that connects travellers looking for authentic experiences off the beaten tracks with Local people, the “Johnny”, who want to show them around their city and share their little universe. We invite you to register on our platform and become a "Johnny" to welcome and accompany travellers from all over the world by offering them private tours, a wide range of activities depending on your tastes and your preferred fields and above all fun ! We look for smiling, friendly, open, communicative and passionate people who like to share their little world and meet new people especially foreigners coming from all over the world. You don’t have to be a tourism expert. The most important is you and your world. Simplicity, good spirit, trust, respect and reliability are the only prerequisites to become a Johnny ! Are you motivated to join our community ? Register now on our website johnnybeguide.com and complete your profile.